Today, I'm reviewing yves rocher's lip balm in coconut flavor. It's a french brand and the lip balm is priced at Rs. 350/- I got it from nykaa.com. The gourmet lip balm ! 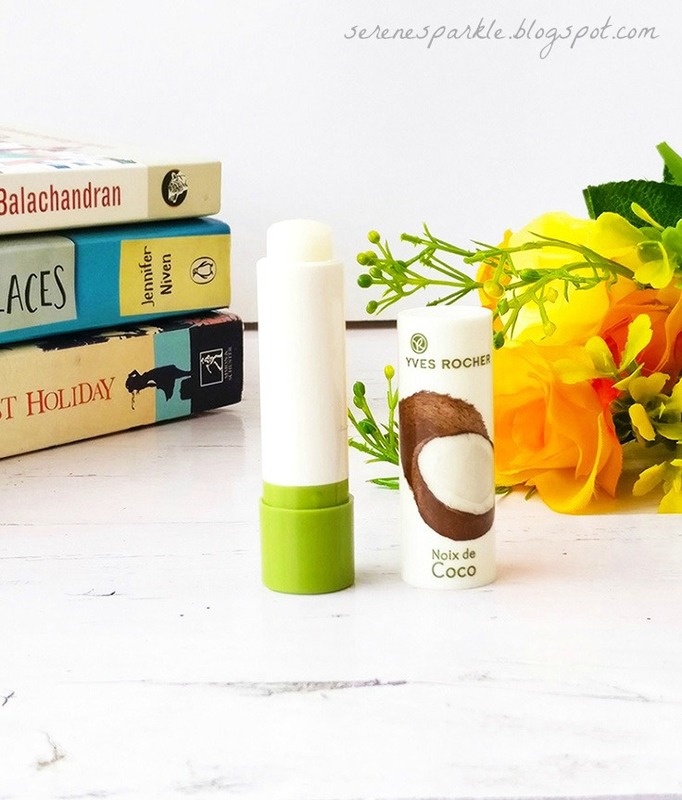 With its creamy texture made with shea butter, macadamia oil, the nourishing lip balm - coconut repairs and soothes dry lips and leaves them feeling instantly comfortable. It's light but has exotic coconut scent ! 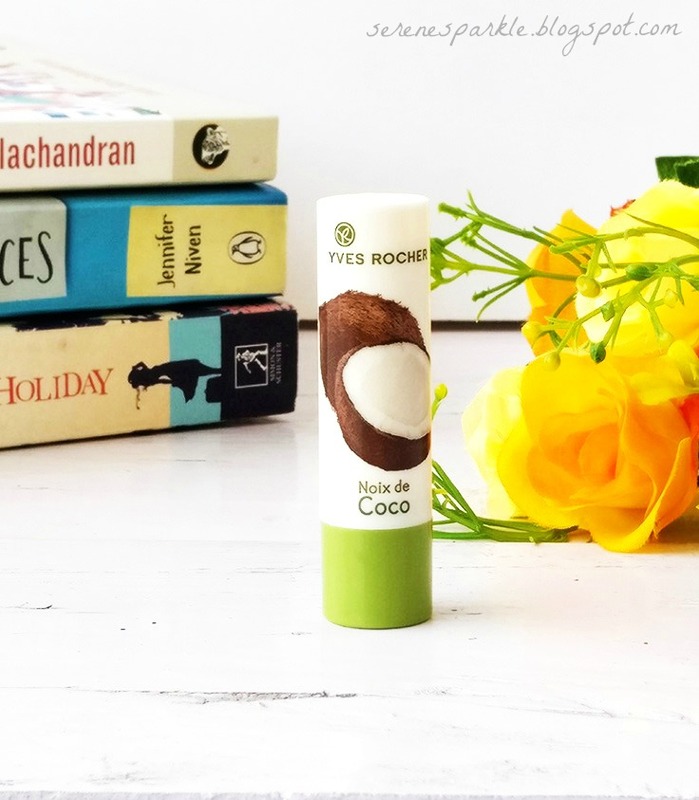 Yves Rocher lip balm noix de coco smells absolutely like real coconut and what I like about the fragrance is that it's not too strong, so even if you are not very fond of coconut scent, you can still give it a try. Although, it comes in total 7 different variants, three of them are tinted (strawberry, cherry, raspberry) and the other four are non-tinted (macadamia, vanilla, shea, coconut) so you've plenty of options to choose from. This chap stick lip balm has a soft, creamy texture and glides on lips like a dream ! It gives an instant moisture boost to dry and chapped lips and adds a lot of shine after two swipes. But, it's not very long lasting due it's light texture. Though, it's a good thing because then the lip balm doesn't feel heavy or sticky on lips at all but frequent reapplication is needed to intensify and make the moisturization last for longer time. I won't say it cures severely chapped lips completely but it leaves them feeling soft, supple and hydrated post application. It's nourishing and soothes dry lips instantly. Now, the price is definitely not encouraging. You can find many lip balms which deliver the same results at a comparatively low cost. My favorite being the lotus herbals lip therapy balm which you can get for like 135 bucks ! If you wanna try a new brand and if you love coconut scent, then go ahead, try this lip balm. Otherwise, you can just stick with the affordable ones and guys, there are just so many available in the market nowadays that are really good quality and come in many different scents/flavors too. Which is your favorite lip balm ? Have you tried yves rocher noix de coco ? 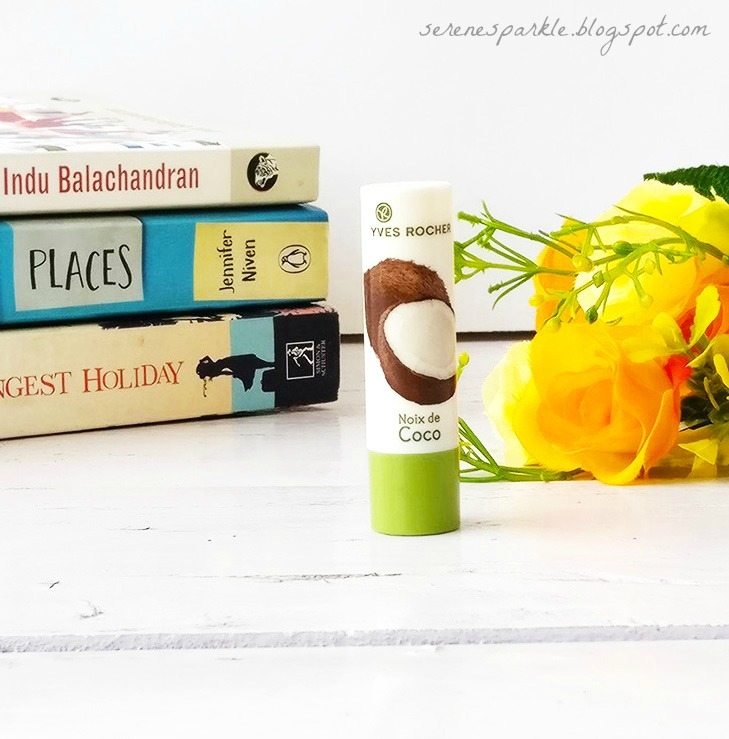 While definitely on the expensive side for a lip balm, this coconut one sounds lovely! I would love to know how the other tinted variations measured up, pigmentation-wise.